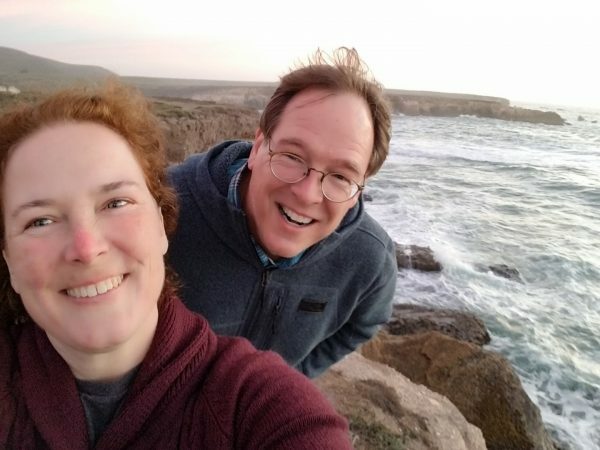 Becca and Ken are moving to the California Coast. My oldest daughter, Becca, has been moving around quite a bit throughout her adult life. After she graduated college in Alabama, she moved to Norfolk, Virginia to attend grad school. She lived there for a few years until she met her husband, Ken. She moved with Ken to Denver, then to Calgary, Alberta, Canada. While they lived in Canada, Becca started taking an online course to complete here Master of Library Science. She applied for librarian jobs in Canada, but was never hired there. Ken is a plant ecologist. His job in Calgary was to do plant studies ahead of the Alberta Pipeline. When the work stopped on the pipeline, he was laid off. They started looking for a job all over again. Ken found a job back in Virginia, this time to Richmond. While they lived Richmond, Becca was hired as a part time Children’s Librarian. And Ken was laid off again. They decided that both of them would look for jobs in Denver, Colorado, which is where they wanted to live. They fell in love with the area when they lived there the first time. Becca was the first one to find a job there, her first real full time job in her chosen field. She was a Children’s Librarian there. During the next eight months, Ken applied for every job in his field that became available in Denver. He was just having no luck finding a job there. Then, in August last year, he was hired by a company in California. He new job let him pursue the field of plant ecology in an area where wine is produced. Then came Becca’s quest to find a position where she could be happy, working in a library, with children. Last month she went to an interview for a job with a library in the area where they are going to be living, but did not get the job. Then, in a fluke of timing, the person who did get the job changed their mind, and it was offered to Becca. They are not in the process of moving to the California coast from Denver. Their Suburu Forester has served them well. One thing that has been constant during all this moving around, has been their Suburu Forester. They drove that car for more than ten years, all over the United States, and most of western Canada. It has been a great car for camping, exploring, job hunting, moving, and just everyday life. They loved it so much that when they bought a second car, it was another Suburu. They take their two dogs sightseeing every free weekend. When I went to visit in Colorado last October, Becca drove me all over the place, to all the sites to see, the restaurants she loves, to her library, and where ever else we needed to go. I think if I ever buy another car, it will be a Suburu.